Only a couple of months old, Cheeky Cosmetics, the sister brand of Cowshed is making waves online with their new range of 21 nail paints and freshly-opened Shoreditch beauty parlour. Not all about nails, the new parlour also offers a range of other treats including the “Cheeky Blow” (a range of four different blow-dry styles for girls on the go), “Cheeky Paint” (A file and paint with the colour of your choice and 10ml bottle to take home with you! ), and a “Cheeky Up Do” (perfect for a night out with a choice of three sophisticated styles). 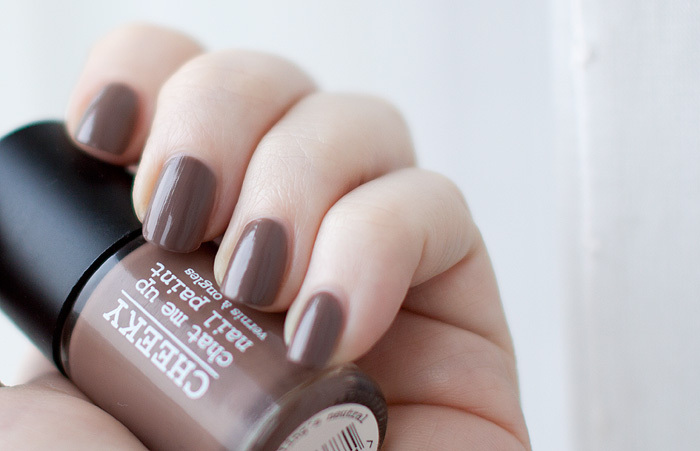 The shade on my tips in the photo is The Feeling’s Neutral, an oh-so-lovely milky mocha that harks back to OPI’s cult classic You Don’t Know Jacques but with a slightly chalkier, softer and more greyed-out edge. Application is quicker than usual with an ultra-wide brush that can suffer from overloading if you’re not careful. Coverage is great in two coats and the polish dries rapidly to a glossy, tough finish. My only complaint about this particular polish lies with the smell, it’s pretty obnoxious but you can take comfort from the fact that Cheeky Cosmetics lists the full ingredients on the website and there’s no sign of the toxic-three anywhere.